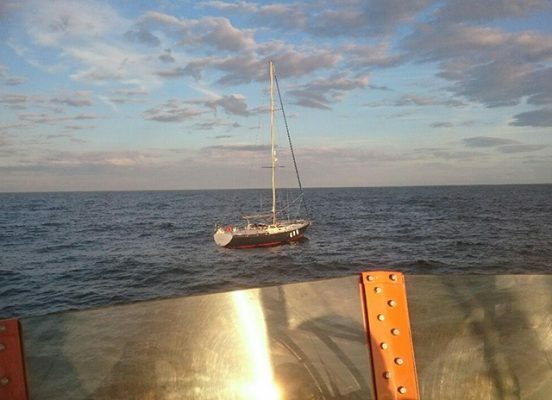 You are here:Home » Category: "Rescue at sea"
Practical Boat Owner: A single-handed yachtsman made a distress call to Humber Coastguard after his engine failed following rough weather. The coastguard rescue helicopter was originally launched to locate the casualty and found the disabled yacht some 61 nautical miles off the east coast of England. The helicopter crew spoke to the sailor who explained he had taken on quite a lot of water in bad weather through the night and his yacht’s engine was now not working. He was happy and fit enough to stay aboard but would need a tow back to safety. The coastguard requested the launch of Humber RNLI’s all-weather lifeboat at around 4pm on Monday night. At 61 miles the lifeboat would take the best part of three hours to reach the man and his vessel so en route the crew worked where the vessel was likely to drift to. While nearing the area, the lifeboat crew contacted the casualty and used their direction finding equipment to confirm the yacht’s location. On scene, lifeboat crew were put aboard to assess the skipper and the yacht’s condition; thankfully the yachtsmen had done a good job of clearing the water and just needed the lifeboat’s assistance to get back the shore. The sailor was put aboard the lifeboat and two RNLI crew stayed to attach the tow. After approximately 11 hours towing back to the river Humber, the yacht was put alongside and into the safety of Grimsby. At 6.50am yesterday morning the RNLI Humber Lifeboat crew returned back to their station at Spurn point after 14 hours at sea. Practical Boat Owner: A single-handed yachtsman has praised RNLI Castletownbere rescuers for saving his life after he got into difficulties 45 miles south of Mizen head in West Cork. 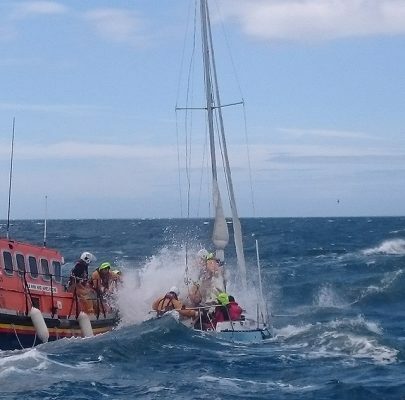 The lifeboat volunteers spent more than 12 hours battling storm-force conditions after the sailor activated an Emergency Position Indicating Radio Beacon (EPIRB) identify his location, raise the alarm and seek help. The Castletownbere lifeboat, Annette Hutton, launched at 8am on Saturday morning, 20 August, after Valentia Coast Guard Radio requested assistance for the yachtsman. The eight-metre (26ft) yacht had left the Azores in early August. The sailor, aged in his sixties, had been in regular radio contact with Valentia Coast Guard radio until Saturday morning when his VHF radio was washed overboard. He activated an EPIRB to identify his location, raise the alarm and seek help. The lifeboat, under the command of Coxswain Brian O’Driscoll, located the casualty at 10.40am. 50 miles south-west of Castletownbere. The Coast Guard helicoptor also attended the incident. Conditions were described as ‘gusting Force 8/9 winds with a 30ft swell’. 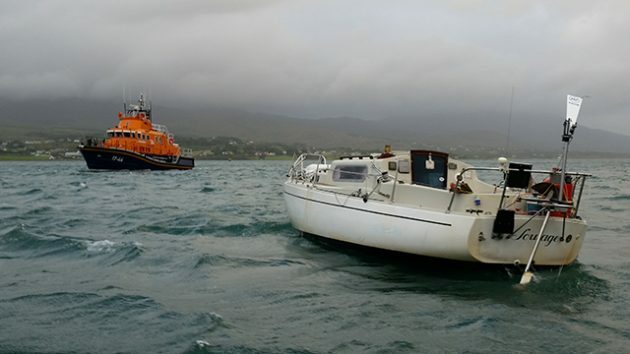 The yacht was taken under tow and the lifeboat proceeded slowly to Castletownbere in challenging sea conditions. Early into the tow lifeboat crew became concerned about the well being of the sailor and crew managed to transfer him to the lifeboat. The lifeboat, with the damaged yacht in tow, returned to Castletownbere at 8.30pm. having been at sea for 12 and a half hours. The sailor thanked the Castletownbere lifeboat and all involved for ‘saving his life’. He said: ‘only for the lifeboat, things would have ended up very badly today’. 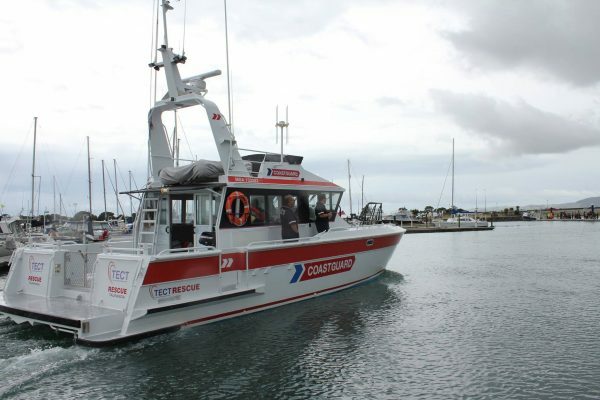 Yachting Boating World: Paul Christenson was sailing in rough seas in the Bay of Plenty, New Zealand when his yacht suffered steering problems. He was forced to leap from his boat to safety. Solo skipper Paul Christenson was sailing his 28-foot yacht, Windsong, from Auckland to Dunedin in New Zealand when the vessel suffered steering problems. He decided to head towards Tauranga. But, unable to continue battling against 35 knot winds and rough seas, he set off his EPIRB at just after 8pm on 9 August. Windsong was 41 nautical miles from Tauranga. The city’s volunteer coastguard responded to Christenson’s distress signal. On arrival, the 54-year-old skipper was forced to leap from his yacht into the arms of the coastguard. Speaking to New Zealand’s SunLive, Christenson said: “I’m lucky they have strong arms”. The skipper had been moving his yacht from Auckland to Dunedin, after moving there with his wife, Michelle. She managed to get a message over the Maritime National Radio to Christenson while he waited for rescue. “I love you. I don’t care about the about the boat. I can live without the boat, but I can’t live without you,” she said. Christenson said he had checked the forecast before setting sail and believed he had plenty of time to get to his destination. However, the conditions became “ugly”. He said he was exhausted by the time help arrived. “I had got my wife’s clothes off the boat, but left my new clothes and heart medication behind. My priorities were all screwed up,” he said. Windsong remains off the Bay of Plenty. It is not clear if the yacht will be recovered. Yachting Boating World: A fisherman has been rescued by the Summerleaze RNLI lifeguards after his boat caught fire off the coast of Bude in Cornwall. A fisherman was forced to jump into the sea after his boat caught fire off the coast of Bude in Cornwall. 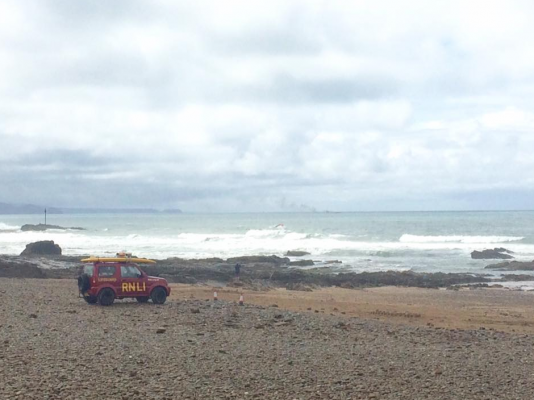 The man was wearing a life jacket and was picked up by lifeguards with Summerleaze RNLI. The rescue happened just after 12pm on 10 August. The UK Coastguard said it had received multiple 999 calls from members of the public reporting the boat fire. It immediately issued a Mayday relay broadcast requesting assistance from other vessels in the area. Summerleaze RNLI lifeguards raced out to sea on a jet ski to pick up the fisherman. He was transferred to a nearby fishing vessel and was brought to shore where he was met by the Bude Coastguard Rescue Team. Cornwall Fire Service were also on scene. The fisherman required no medical assistance. Bude and Padstow RNLI lifeboats were also sent to the burning vessel to monitor the situation. The 6.3 metre boat is now reported to have sunk. “By taking this simple safety precaution, it meant that when he fell into the water his survival time increased significantly. He was also able to raise the alarm on the VHF radio,” noted Instance. He urged anyone going out on the water to “take a good method of communications”. “On a boat a VHF DSC radio is ideal, and a mobile phone in a sealed plastic bag is a good back up. Call 999 and ask for the Coastguard in an emergency at sea,” advised Instance. “And of course wear your life jacket. This could have been a very different outcome today had he not been wearing a life jacket and we commend his actions, which have assisted in saving his life,” stressed the duty controller. 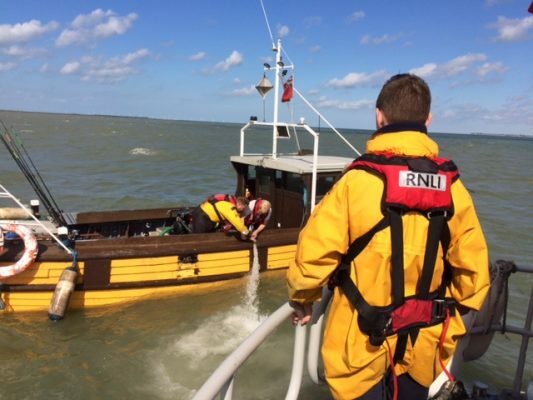 Yachting Boating World: Whitstable and Margate RNLI lifeboats were launched jointly to rescue ten fishermen and save their boat from sinking off the north Kent coast. On Sunday 7 August coastguards received a call from a charter angling boat reporting that they were taking in water and in danger of sinking in the River Swale. There were ten people on board the boat. Margate’s all-weather lifeboat and Whitstable’s inshore lifeboat were both attending the annual Whitstable Regatta when the mayday call was received. Whitstable’s inshore lifeboat arrived quickly at the scene to provide lifesaving assistance. As the ingress of water on the boat could not be controlled Margate’s all-weather lifeboat provided assistance with their portable salvage pump. The fishing boat crew were taken safely ashore at Harty of the Isle of Sheppey by Whitstable lifeboat. The fishing boat could be saved and was towed by Margate lifeboat to the entrance of Faversham Creek. The Whitstable lifeboat was able to beach it safely at Hollowshore. Paul Hodson, Lifeboat Operation Manager, Margate Lifeboat said: “This joint operation demonstrates the importance of having a balanced mix of various lifeboats covering the north Kent coast. Without the rapid response of Whitstable’s inshore lifeboat and the additional capabilities of Margate’s larger all-weather lifeboat the outcome to this story could have been very different”. 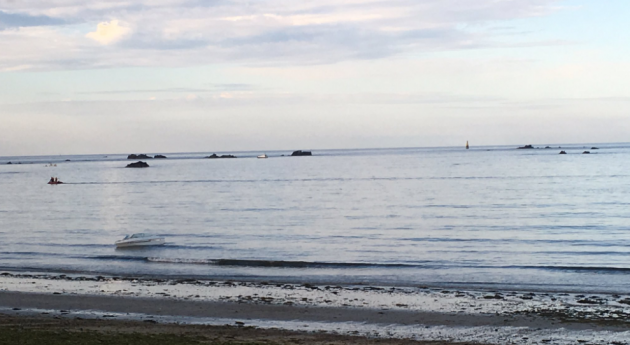 Yachting Boating World: A man in his 30s was rescued by a passing jogger after he was spotted close to a partially submerged boat at Greve D’Azette, Jersey. A submerged car was also found. Islander Lucas Parker spotted the man off the Greve D’Azette Slipway, Jersey, struggling in the water. He had been out on an early morning run with a friend on 22 July. Parker swam out to assist the man, helping him back to the partially submerged boat. The pair were then quickly picked up by the Jersey Fire Service’s inshore rescue boat which had been launched. The police and coastguard were also on the scene, having been alerted at around 6am by members of the public. The man, who is in his 30s, is now recovering in hospital. A completely submerged car was also discovered at Greve D’Azette Slipway. It has now been marked with a red buoy after a search by divers found there was no one trapped inside. The vehicle was not visible from the shore as it was completely covered by the fast flowing incoming tide.The boat has now been towed ashore. “By swimming out and rescuing the casualty and climbing aboard the partly submerged vessel with the casualty, he ensured the casualty had the best chance of survival and his actions are to be commended,” continued the crew commander. “This incident utilised a lot of different agencies who all came together to resolve this incident and demonstrated the interoperability of the Uniformed Services, Ports of Jersey and the Infrastructure Department to bring this incident to a successful conclusion,” concluded Channing. The cause of this incident is currently being investigated by States of Jersey Police in liaison with Jersey Coastguard. Practical Boat Owner: A dispute with lifeboat and hovercraft crew volunteers over a new training programme and the station’s management has resulted in the RNLI taking New Brighton lifeboat station temporarily off service for several weeks. The charity has decided to ‘stand down’ several volunteers who have refused to commit to the standards required of all RNLI volunteers, which means that New Brighton will not be able to operate safely in the short term. A spokesman for the lifeboat charity said: ‘Over the next few weeks, RNLI teams will work with the station’s remaining volunteers, offering enhanced training and support, and creating a more positive environment for the crew. We aim to reopen the lifeboat station for a period in August. ‘We would like to reassure the public that we are confident that the lifesaving service provided by the RNLI to the people of Merseyside and the Wirral will continue to be carried out effectively by RNLI lifeboats stationed at Hoylake, West Kirby and by local lifeguards. 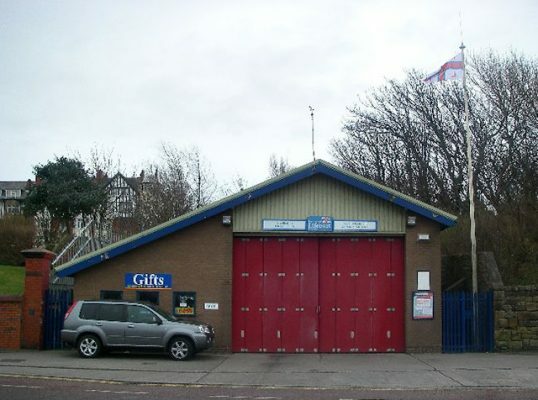 The station has been affected by a dispute over several issues – the introduction of a new training programme, the station’s management, the outcomes of an investigation into various issues with the lifeboat crew, the attempts to address deficiencies at the lifeboat station and breaches of the RNLI’s Volunteer Code of Conduct. The spokesman added: ‘Those stood down are clearly unhappy but they do not represent the views of the majority of the crew, who we are pleased to say want to continue with the RNLI. Divisional operations manager Lee Firman said: ‘We explored a number of options for New Brighton before taking this step. Closing a lifeboat station, even temporarily, is not a decision to be taken lightly but we are confident that this is the right way forward. Practical Boat Owner: The ‘importance of carrying a good VHF radio and not relying on a mobile phone’ was demonstrated when a yacht got into difficulties in the eastern Irish Sea. 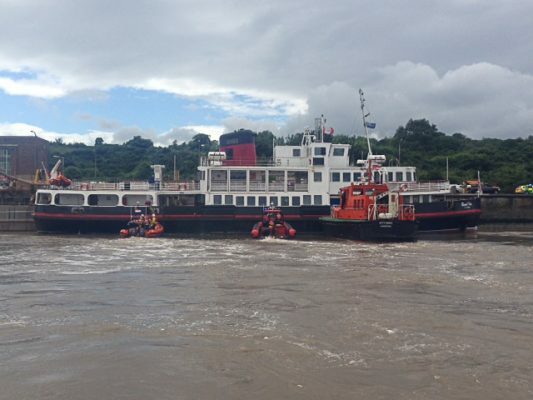 Yachting Boating World: The Mersey ferry, Royal Iris ran aground and started taking on water near to the entrance of the Manchester Ship Canal at Eastham. 69 passengers were on board. More than 70 people were rescued from the Royal Iris passenger ferry after it ran aground and started sinking on the afternoon of 10 July. The grounding at Eastham, Wirral, resulted in a hole in the hull. The vessel, which starting taking on water at the stern, was carrying 69 passengers and five crew members. The multi-agency rescue operation involved the New Brighton RNLI, the Merseyside Fire and Rescue Service, the Port of Liverpool Police, HM Coastguard and the North West Ambulance Service. No one was hurt in the incident. Practical Boat Owner: A single-handed French sailor was rescued six miles off the Wicklow coast after making a distress call. The solo skipper was on passage from France to Norway, when his yacht’s twin rudder suffered damaged and he was unable to steer the vessel. With a towline established the ten metre yacht was taken back to Wicklow harbour. Due to the conditions at the time, the journey took more than 90 minutes as the line parted on three occasions. This was the second callout over the weekend. On Saturday morning during the Round Ireland Yacht Race, Wicklow RNLI Helm Vinnie Mulvihill was busy preparing the inshore lifeboat for exercise. He heard a person on the East pier shouting that someone was in the water. Quick thinking Vinnie left the boat and entered the water to assist the women after she slipped and fell in while going ashore from a moored boat. Vinnie brought the women alongside a nearby boat and with the help of the occupants; she was taken out of the water. 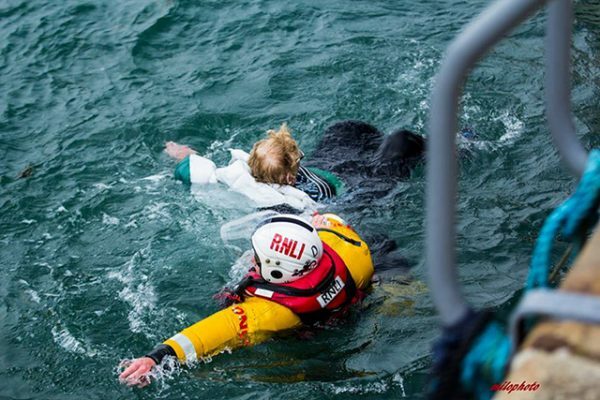 The woman was brought to the lifeboat station and assessed by first aider Carol Flahive. No further medical assistance was required. She left the station none the worse from her ordeal after a cup of tea and changing into dry clothes.